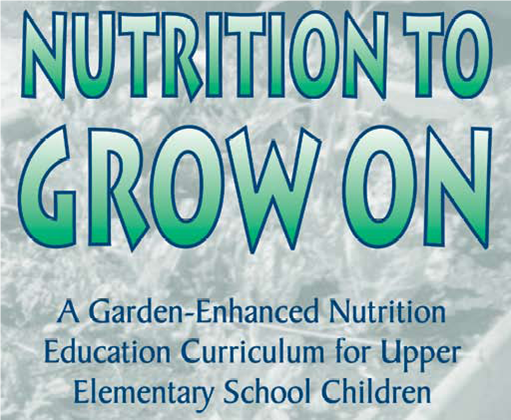 NUTRITION TO GROW ON is a captivating curriculum that links gardening and nutrition through lessons that include science, math, language arts, history, environmental studies and health competencies. When students eat the produce they grow, whether it is fresh from their own school garden or prepared as part of a school lunch program, they are exposed to new tastes and foods. When students have become a part of the process to get the food they eat to their plate, they are much more inclined to try that new food that is placed in front of them. This in turn encourages healthier food choices. NUTRITION TO GROW ON focuses on grades 4-6, however, it is flexible and can easily be used in other classrooms and learning environments. The principles behind this curriculum were to make it fun, easy, integrative and adaptable. It is divided into 9 lessons preferably taught sequentially. However, lessons may be adapted and used individually to better fit the dymanics of each classroom. "Additional Activities" are included in each lesson for follow-up and additional snack ideas. Background information and family letters are also provided.